So it goes with this honey sweet, golden dessert wine. The former toast of the drinking world now relegated to a dusty corner of the wine shop, if it can be found at all. Prior to Nicole and I visiting the Sauternes wine region last fall, I'd tasted its wines less than a handful of times. We'd had a sole half bottle in our collection for years, slowly turning a deep amber hue, but seemingly too precious to uncork. (We've since learned: don't wait forever, drink the wine!) Besides that, I knew of Chateau d'Yquem, the undisputed champion of Sauternes wines. That was the whole of my knowledge. But when in France, right? So on an overcast day last fall, Nicole and I made the 45 minute drive south from the city of Bordeaux. We'd made two tasting reservations in Sauternes through the Rue des Vignerons app: Chateaus Sigalas Rabaud and Rabaud-Promis, neighboring estates positioned a mere stone's throw from famed Chateau d'Yquem. We arrived to an area rich in wine making history and tradition. In 1787, no less than Thomas Jefferson, then the United States' Minister to France, made a tour of Bordeaux wine estates recording that, "Satuerne. This is the best white wine of France...." Later that year, he placed an order for 250 bottles of 1784 Chateau d'Yquem and after that ordered thirty dozen d'Yquem bottles for George Washington. 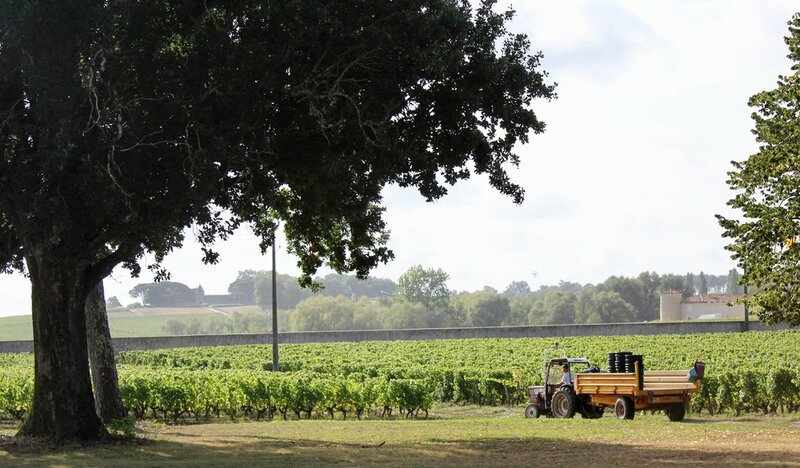 Upon arriving at Chateau Siglas Ribaud, we immediately felt immersed in the area's centuries long wine making tradition as workers hurried about harvesting fruit for the chateau's dry white wines. We learned that the sweet wine grapes wouldn't be harvested until weeks later, after they'd become infected with Botrytis cinerea, a fungus known as "noble rot" which gives the area's grapes their concentrated sweetness. In short, the fungus works its magic by creating tiny holes in the grapes' skins which in turn cause water within the grapes to evaporate, thus heightening the sugar content of the fruit and resulting wine. One of the main reasons we chose to visit these two particular producers was their intertwined histories. From the 1600's, these neighboring properties shared common ownership, until 1903, when the Sigalas family sold Ribaud-Promis. For a time thereafter, the properties continued to be operated jointly with both names appearing on wine labels. 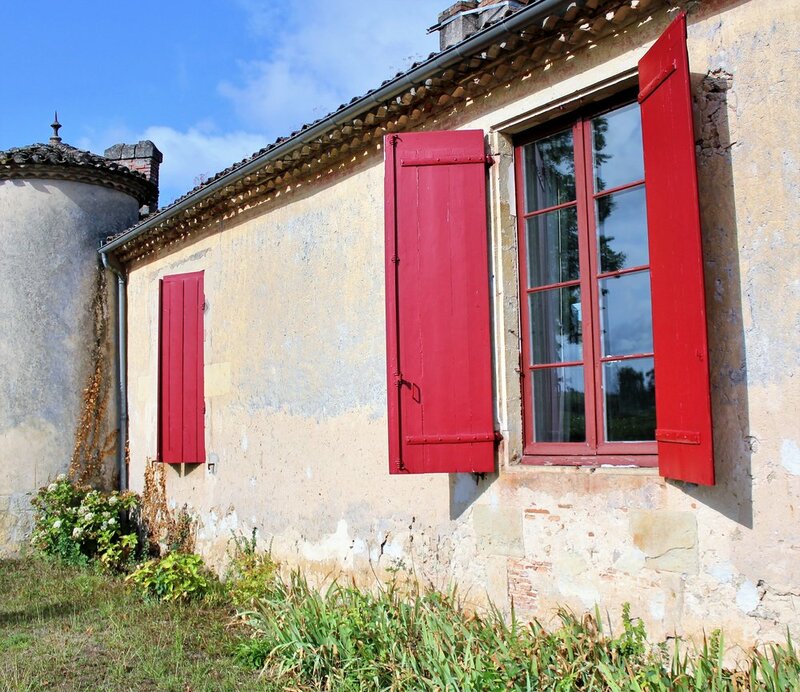 But since 1950, after a subsequent sale of the Ribaud-Promis property, the two chateau have been owned and operated separately. We thought it would be interesting to see the differences. Sigalas Ribauld is no doubt the more "corporate" of the two today. (Although, compared with some of the high flying Bordeaux estates we visited, it is still a very boutique operation.) A dedicated tourism specialist shepherded us through the vineyard and grounds and conducted our tasting. We met owner/winemaker Laure de Lambert Compeyrot, but it was a brief encounter as she understandably rushed around with harvest work. We enjoyed both our visit and the wines, though the experience felt very similar to many other Bordeaux chateau we visited -- grapes, cellar, taste, purchase. As we headed to our car and our next appointment, we asked about the best way to get to Ribaud-Promis. No, we were told, not the paved road Google Maps directed us to. Instead, our host pointed down a dirt farm road bisecting the vineyards. We bumped along for a quarter mile in our little rented Fiat 500 and arrived ready for our second tasting. Upon our arrival, a handful of vineyard dogs greeted us enthusiastically at the car, along with owner/winemaker Thomas Dejean who escorted us to his modest, cozy tasting area. This was a tour and tasting we would not soon forget. It initially progressed like other smaller vineyards we visited throughout France, where we were able to sit down with the owner/winemaker rather than a tasting room employee. We generally preferred this, although there are positives and negatives. On one hand, the winemakers are obviously more intimately involved in the process and business and could answer more in depth questions. On the other hand, we found there was often an English/French language barrier typically not found with tourism employees and the winemakers often couldn't (or didn't want to) spend as much time with us owing to other winery responsibilities. Moreover, we noticed throughout France that locals (or even European tourists), if they visit a winery, generally quickly taste one or two wines they imagine they might like. Although we could not understand the words spoken, it usually seemed something along the lines of, "I typically like lighter wines, so can I taste one or two of your lighter wines," before purchasing a 12 bottle case and setting off. Contrast this with American tourists, like Nicole and I, who want to sit down, ask all sorts of questions, tour the vineyard and cellar, taste most of the wines, give our thoughts on the wines and ask more questions -- then proceed to purchase a few bottles. Put this way, I can certainly understand why Nicole and I, unquestionably U.S. tourists as soon as we opened our mouths to speak, were often initially greeted by winemakers with a certain friendly coolness. But Mr. Dejean was nothing but friendly from the start. We spent approximately an hour tasting various wines, petting his dogs, looking around the cellar, and generally asking all sorts of questions about the wines, the vineyard, and even local soccer. Mr. Dejean could not have been a more gracious host. And the wines themselves were delicious -- lots of sweet, ripe fruit balanced with with butterscotch, caramel, and floral notes. It amazed us how, even though much sweeter than standard wines we are accustomed to, each vintage presented its own readily apparent nuances. Nicole and I were charmed. At one point, after we inquired, Mr. Dejean rummaged around in the cellar and was able to find a vintage 1981 bottle, Nicole's birth year, for us to purchase. This was the coup de grâce. As we prepared to leave, we asked if Nicole could get a picture to remember our visit. Smiling, he told us to wait for a moment while he disappeared into the back room. 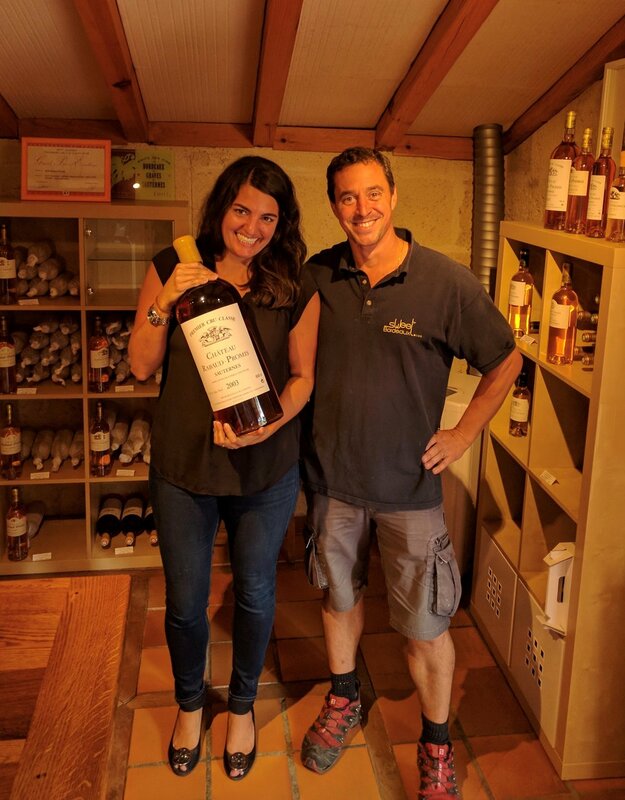 He returned with a prop, which is how Nicole ended up posing with the largest bottle of Chateau Rabaud-Promis on the premises in the photo below which is one of our favorites from our travels. As is probably apparent, Nicole and I left Sauternes with a real appreciation for these largely forgotten wines. I hope the main takeaway for anyone reading this is to give the wine a try some evening after dinner. It is like sipping nectar. According to Wine Folly, with roughly 120–220 g/L of residual sugar, the wine is sweeter than Coca-Cola (113 g/L). Sauternes feels thick on the tongue, with flavors along the lines of tropical fruits, caramel, honeysuckle, marmalade, and stone fruit. Certainly not your everyday Merlot. Because of this, it is not a wine meant to be drunk in large quantities. For Nicole and I, half bottles make the most sense -- and that is often how shops sell these wines. (As an example, a wine-searcher.com search for Chateau Rabaud-Promis shows that it is available in many markets, typically around U.S. $20-$50/half bottle.) Take a risk the next time you spot one for a special occasion! As for what specific bottles to buy? There typically isn't much selection at wine shops so usually it's a matter of purchasing what's available. But in general, Sauternes, like other Bordeaux wines, were famously classified during 1855, a ranking that still exerts much influence today. Unlike Bordeaux's other wines, grouped into five classifications, in Sauternes there are only three: Premier Cru Supérieur, a classification bestowed solely upon Chateau d'Yquem -- First Growths, which include both Chateaus Sigalas Rabaud and Rabaud-Promis -- followed by a handful of Second Growths. Beyond those roughly twenty "classified" Sauternes wines are the rest of the "unclassified" Sauternes wines which can be great bargains. In general, the classification status of Sauternes wines remains a roughly good guide to quality and how much one might expect to pay. But in my and Nicole's experience, we've almost never been disappointed with a Sauternes we've picked up, regardless of classification. Sauternes is a forgotten treasure of the wine world, and one of the many reasons Nicole and I keep exploring. Salud!